By now many of our readers may have had the chance to read about the latest market share numbers put out by Nielsen. 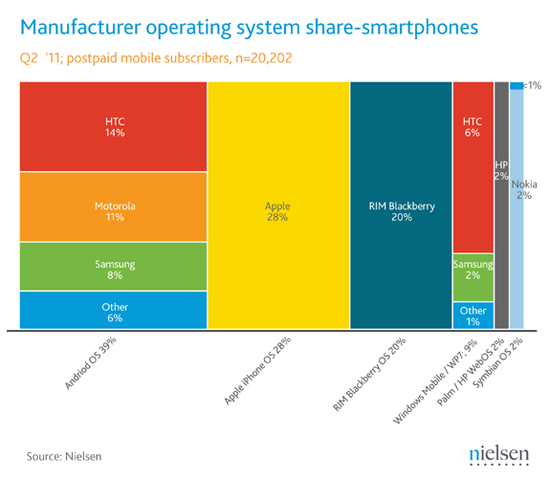 In that report, Nielsen attributed 9% of the market to Windows Phone/Windows Mobile. The exact breakdown is unclear, and the total market share could get worse before it gets better. With the release of Mango and a slew of new devices headed to the market (not to mention the Nokia partnership), hopefully we will see some growth in the fourth quarter. What do you think? Can Microsoft reverse the slide? Microsoft waited too long -- WP7 is another Kin, on a much larger scale. Yea, yet another piece of statistical smoke. It's a snapshot in time of what 20,2002 folks have in their pockets. Not sure what that is supposed to say in the absense of any other parameters. I wouldn't make predictions based on it. Even if it never changes, I wouldn't ascribe success or failure to any of the platforms. Are folks happy with the product and is the product profitable to the manufaturer? Go over to http://en.wikipedia.org/wiki/Usage_s...rating_systems and take a look at those statistics. Apple, OSX and iOS combined, have 10.2% of the market with MS coming in at 80.73. Apple might as well pack up and go home. They obviously don't have a chance. Windows phone probably needs to do better to be a product that is making MS money as opposed to being a cost center, but it isn't clear to me that it needs to decimate the other OSs to do that, or even have the lions share to do so. (vieled MAC OS reference ) That might be a corporate goal, but it would be a shame if WP7 were abandoned simply because they came in second or third, or some percentage, rather than first. For a while Apple tried to gain OS dominance, and it nearly killed them. When they accepted the 'think different' ideal, being a boutique system that didn't play in the crap-plastic-barely-outlive-warranty market, they found a very workable niche that has been amazingly successful for almost 15 years. Interestingly Apple finds themselves in the same place with Android - they are competing against a sea dominated by cheaply made hardware given away for nearly free on 2 year contract, which seems near death well before the contract is up. I have started buying my Android phones on eBay as a result of that ... and it is a complaint seldom heard about iPhones. As for Microsoft, they are not a '2nd place' company, and certainly not a 3rd place company. I for one have no issue with 5 players - iOS, Android, Windows Phone, RIM and webOS - competing for space. But I doubt that Microsoft can deal with that - they have always been a 'win at whatever cost, be it financial or anti-competitive and regardless of impact to customers'. I hope that with W8 MS will stop trying to copy Apple "walled garden" business model and will go back to what made Windows successfull. Windows Phone doesn't need to be first, but it is not the same as Apple; Apple has high margins on their hardware sales, whereas Microsoft is selling licenses. Given that, Microsoft needs to sell far more than Apple does, given fixes costs (development, support, distribution, etc.) to recoup their investment in a meaningful way. I get that. It needs to be profitable. Just hope the goal is profitability not market saturation. Too many good products out there with companies behind them that know how to market. Well, to undercut my own argument a little bit, it doesn't quite need to be profitable initially; Microsoft has the cash to ride it out, and they did for the Xbox platform until it turned around. But, as a licensed piece of software, they need to move licenses for mindshare. In any case, we'll see where Microsoft ends up with this sooner or later. I do think they need Nokia to move some units, because they aren't doing a very good job of producing buzz at the moment. ......... they aren't doing a very good job of producing buzz at the moment. No kidding. Haven't seen a Windows Phone ad in 6 months. Can't find a working model at the carrier stores, and if you happen across one, the sales droids (oddly appropriate characterization) will rip it out of your hands and slap an android or iphone on you.